The cable dial was loaded with idiots criticizing President Barack Obama for bowing to the Emperor of Japan. ‘We don’t bow,” these morons cried. Fox News, CNN, talk radio – the list goes on. Doesn’t anyone fact check? Doesn’t anyone do a Google search? I did hear that President Obama wasn’t the first U.S. president to bow. Keith Olbermann, Jon Stewart and Randi Rhodes all mentioned it. President Obama’s bow was more respectful than President George H.W. 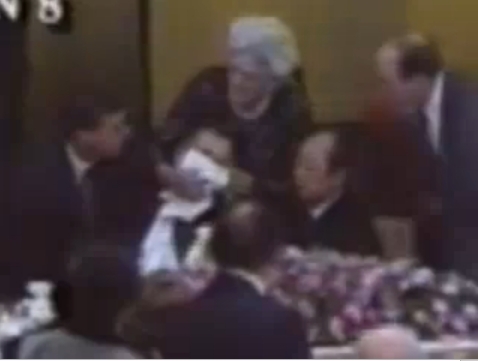 Bush throwing up on the Japanese Prime Minister in 1992. Even President Ronald Reagan bowed when appropriate. 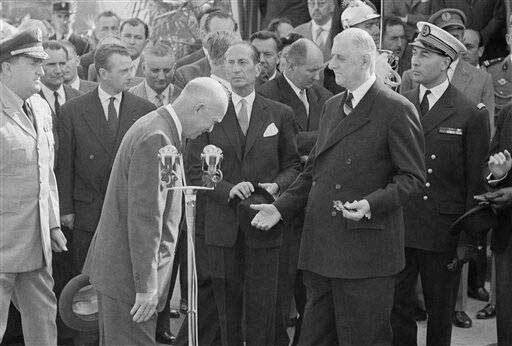 President Dwight Eisenhower bowed to French President Charles De Gaulle in 1959. Anyone remember that President Richard Nixon bowed to the Emperor of Japan Hirohito? I’m sick of these pundits feigning anger and shock when a little research easily makes their claims look ridiculous – however their viewers and readers will never know the truth. Do you really think the gang on Fox & Friends will tell their viewers that they were wrong when they criticized President Obama for respectfully bowing to a world leader since Presidents Bush, Eisenhower and Nixon did so as well? This entry was posted in Barack Obama, Democrats, My 2 Buck$ of the Day, Politics, Republicans and tagged Bush, Eisenhower, Richard Nixon, Ronald Reagan. Bookmark the permalink. 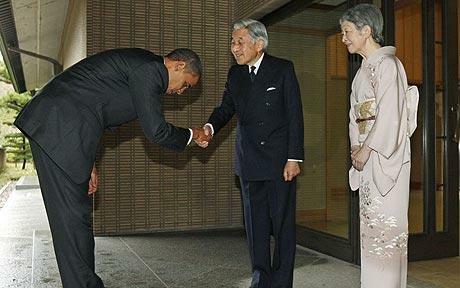 Obama bows as a symbol of subserviency, attempting to use a traditional exchange of bows showing equal respect. You’ll notice nobody bows back. That is what is unique. For the first time a U.S. president mistakenly thinks that he can gain respect and peace by playing nice. The world is governed by the aggressive use of force. Whether you think a country evil or victim, bow to them and the evil ones will smile and deceive you, and the victim ones will claim vindication, justification and demand reparation. Bush is clearly receiving a medal. 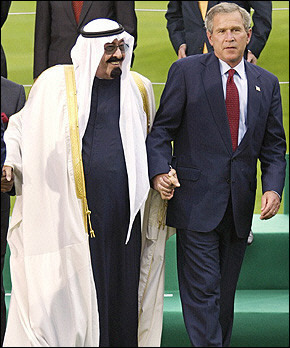 He holds the Saudi’s hand because the guy would fall over if he didn’t. 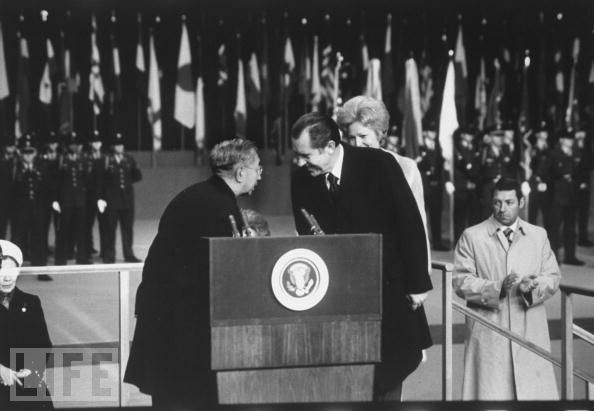 Nixon is clearly trying to hear what the Japanese guy is saying. 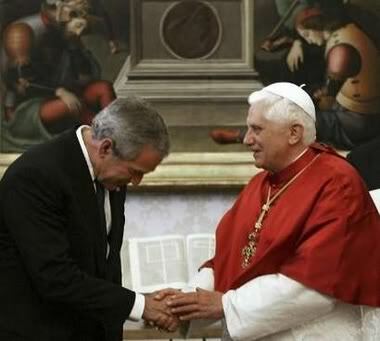 Bush bowed to God, not the Pope. I don’t know about Eisenhower, but it looks like he’s watching his step. And Reagan, he’s just being nice to a Democrat. Hilarious. I don’t think Fox News could have responded better. 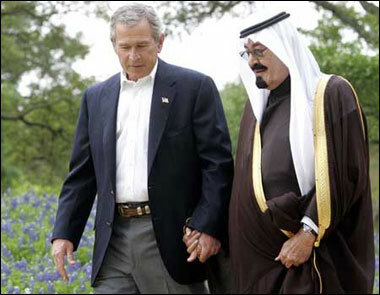 So I suppose you justify the Saudi / Bush kiss as the Saudi falling and is caught by Bush’s mouth. One can only be amazed at the supreme arrogance and ignorance that has arisen in my beloved America. I’m finding it very difficult to believe that you seriously consider a courtly bow which is the etiquette of Heads of state, as similar with the full on bending of the knee and kissing of the raised hand. Since there has been much rhetoric on line in regards to this and apparently you don’t know the difference either, I will provide a rudimentary discourse. The etiquette for Heads of State is to give a courtly bow of the upper part of the body while remaining up right so as not to show fealty to the head of the other nation. Even Obama’s bow to the Japanese Prime Minister was considered acceptable because that is simply a version of a common bow in Japan, He was showing respect to the culture. What Obama did in the picture I downloaded and commented on in my blog, was to either knowingly or unknowingly was to completely lower himself to the ground, on one knee and kissing the outstretched hand of the head of state in front of him who did not even get out of his chair in respect to the President of the United States of America. That is an insult and affront to the dignity of America and the office of the President of the United States of America. Now while I don’t care for Obama one whit, he is the POTUS, as such I respect the position of POTUS and the Constitution of the United States and Obama has stated numerous times even before his election that the Constitution is not written in stone it’s a fluid document. He has spent in the eye of Americans by violating several long standing traditions and by ignoring their voice since his election. This is just one of several affronts to the people he swore and Oath to protect, honor, and serve, and to the Constitution he swore an Oath to uphold, honor and serve. Thanks for the comment on this 6 month old post. I’m guessing you and Rush were fine with the pictures of Bush and the Saudi Prince. What were they doing in that picture? Your arguments are older than this post. You also seem to have forgotten the 8 years that preceded the Obama presidency. You may wish to spend a little time reviewing those 8 years and the effects on the Constitution. I found the post via another post. I am not arguing that Bush didn’t make a lot of mistakes. Anyone who denies that Bush sold us down the river before Obama hasn’t read a paper or watched tv much. I’m conservative but i’m not an idiot. No it has nothing to do with Rush Limbaugh. He’s insulting, even though I agree with some of the things he says you catch more flies with honey than a nuclear bomb. I’ve seen a lot of pictures of Bush walking arm in arm with dignitaries and bowing from the waist up and the neck up but I have yet to see any pictures of him getting on one knee and kissing the signet finger of another dignitary who’s sitting. Agreed about Bush senior. And Reagan bowed down to a dog. Presidents have bowed down to foreign dignitaries for years – even a French one. I personally think people made too much of the Obama bow / kneel. Non-Catholics may have been offended by that photo of Bush with the Pope. Let’s also not forget that the Saudi’s reportedly funded the last 3 presidential libraries (Bush, Clinton, Bush). For all we know, Obama was negotiating a deal for his library. Worthless shill piece. Bush is clearly bowing in prayer in the scene with the Pope and having something hung around his neck in the picture below it. Your point is cogent but you muddy it and betray your utter lack of integrity when you make blatant efforts to misrepresent the material you present as evidence of that point. REAL principal values are steadfast and don’t vary, as evidenced in one’s behavior, depending on whether you happen to view the person/issue you are critiquing favorably. Moreover, bows to a dog? Give me a freaking break? Every time I bend down and pet my dog I’m bowing? You have not an honest bone in your body. Dave – I’d like to thank you for commenting on a 4-year old post. 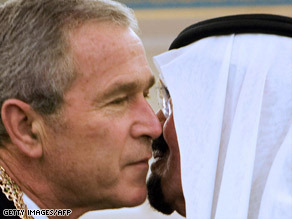 You have brought in such excellent commentary that I have decided to forego my rule of not approving comments on FOUR YEAR OLD POSTS..
I’ve noticed that everyone that critiques this post ignores the picture of Bush kissing the Saudi Prince. What’s even more amazing is how you clearly missed the point of this VERY OLD POST. By showing these other pictures, I am showing the ludicrousness of the attack that Obama bowed. I suspect what brought you to this sight was the “offensive” handshake with Raul Castro. We’ll leave that non-issue for another story. Your third sentence has me most confused. You said I betray my utter lack of integrity. Does that mean I normally lack integrity and this post betrayed it because it is filled with integrity? And I’m glad you came back with a 2nd comment to mention the dog. Because yes. 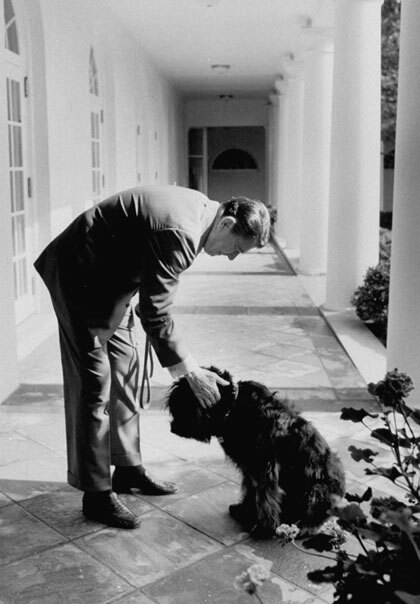 I was seriously suggesting that Reagan was bowing to a dog out of respect. Are you kidding me? Do yourself a favor and start posting comments on articles written in 2013 or at least in this decade.